VILLEROY & Boch (V&B) now offers a wide selection of products, which are made from low-maintenance materials and finishes, combined with ultra-modern toilet technology to enhance hygiene in bathrooms as well as eliminate the hard work involved in keeping them clean. To actively repel dirt that quickly accumulates through daily use, Villeroy & Boch has developed CeramicPlus, an innovative finish for all ceramic surfaces, which is easy to clean with the use of a damp cloth. Even if limescale residue builds up due to hard water, this can be easily removed on a CeramicPlus surface without the use of aggressive cleaning agents. “The company has also set new hygiene standards with the innovative WC (water closet), DirectFlush. Instead of the customary rim, the rimless DirectFlush toilet channels the water to ensure the toilet bowl is flushed thoroughly and avoid over-splashing – which is prevented by a special guard at the top of the bowl, as well as by the higher position of the water jets,” says a spokesman for V&B. These completely enamelled rimless toilets are quick and easy to clean. 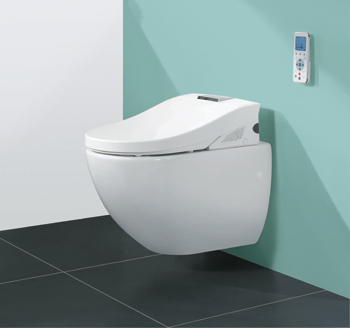 The modern flush technology used in these toilets offers an undiminished flush performance using just three or 4.5 litres for a complete flush, ensuring the bowl does not become soiled. Meanwhile, Villeroy & Boch has introduced the ViClean-U and ViClean-L shower-toilets, which are a clever combination of a toilet and bidet. Developed by leading experts and renowned designers, the new and hygienic ViClean-U and L range toilets combine functionality with aesthetics, says the spokesman. ViClean-U uses just 430 ml of water per minute, and ViClean-L shower-toilets fit harmoniously with all bathroom styles making the shower experience as pleasant as possible, says the spokesman. Dornbracht, a premier manufacturer of premium fitting and accessories for kitchen and bathrooms, introduced innovative new products for the kitchen at the LivingKitchen 2015 exhibition in Cologne, Germany, last month. These include the Sync and Tara Ultra pull-down fittings and supplements to the eno series. Sync is a new kitchen fitting that enhances Dornbracht’s iconic design language, according to a spokesperson for Dornbracht, who adds that its optimum functionality is a further factor of excellence. “This new product launch coincides with Dornbracht’s introduction of a new functionality – a pull-down fitting with a spray function. The spout can be extended downwards and flexibly directed to wherever it is needed, thus increasing a radius of action around the sink. The pull-down function type offers two spray modes that are geared to the intended use: a natural, clear, laminar flow and a powerful spray flow,” he says. The new function type is also added to the Tara Ultra fittings series. From this year, a pull-down version of this classic fitting will also be available, with the typical design language of Tara Ultra – the tall, slender spout and the right-angled lever – still setting the trend. Two new raised spout fittings are being added to the successful eno series: one variant with an extending spout and the other with a twin-flow pull-out spray. Regular flow or spray flow are selected at the touch of a button. Pots and pans can be quickly and precisely filled with regular flow, whereas the wide spray is perfect for thoroughly washing vegetables, fruit, meat or fish, the spokesman says. Both fittings are raised by 90 mm to suit the requirements of a kitchen. 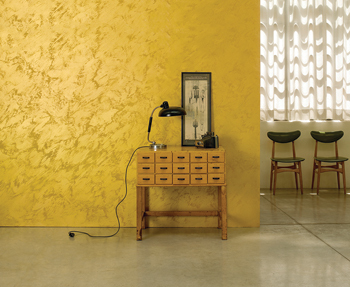 Kansai paints ... sophisticated finishes. KANSAI Paint, one of the global leaders in the paint and coatings industry, has introduced a range of innovative products featuring cutting-edge technology. These include the Artisan Viero range that offers sophisticated finishes developed for bespoke lifestyles. Using lime-based solutions, these natural products provide long-lasting, elegant finishes that are environment-friendly and suited for smooth, well-prepared masonry surfaces and flooring. Kansai Paint’s products feature Active Benefits that can help reduce the temperature within buildings and even kill disease-spreading bacteria. Its extensive range of premium luxury coatings is available in more than 1,500 inspired colours. From washable, stain and scratch-resistant paints for homes, to anti-microbial paints that can kill disease-spreading bacteria in hospitals, bathrooms and children’s bedrooms, Kansai’s coating solutions are engineered to meet a wide range of functional needs. The company also offers the Artisan Casa range that embodies the essence of beauty, distinction and glamour. Each product in the Casa range presents a unique mood: bold eminence, refined elegance, sophisticated glamour or friendly warmth.